Celeb Gossip News – Fantastic Beasts 2: Who stars in the Crimes of Grindelwald? Who plays Dumbledore? Eddie Redmayne returns in Fantastic Beasts: Crimes of Grindelwald as Magizoologist Newt Scamander. Scamander joined the Ministry of Magic, spending two years in the Office for House-Elf Relocation before joining the Beast Division. Early in life Scamander developed an interest in magical creatures, influenced by his mother’s breeding of hippogriffs. In The Crimes of Grindelwald, Joshua Shea portrays a young Newt. Jude Law joins the cast as a young Albus Dumbledore and Johnny Depp stars as dark wizard Gellert Grindelwald who caused disruption in the wizarding world during the 1920s. Callum Turner plays Newt’s older, more successful brother, aurora Theseus Scamander and Brontis Jodorowsky will take on the part of Nicholas Flamel. There are a few new faces in this film, namely Leta Lestrange played by Zoë Kravitz and Claudia Kim plays Nagini. The actress said: “It will be so interesting to see another side of Nagini. You’ve only seen her as a Horcrux. Newt’s friend from the previous film, such as Tina and Queenie Goldstein and muggle Jacob Kowalski will be returning to lend Newt a helping hand. Jamie Campbell Bower and Toby Regbo will reprise their Harry Potter roles as young Grindelwald and Dumbledore. And Jessica Williams, Derek Riddell, William Nadylam and Poppy Corby-Tuech are also on the cast. 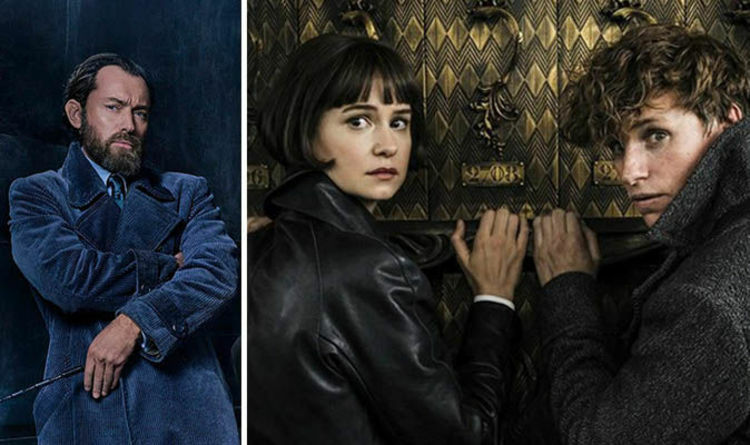 Fantastic Beasts: The Crimes of Grindelwald is the second in five-film series and series producer has said each of the sequels will have its own distinct flavour. He told Digital Spy: “This next film is different to the first, but each film will march to its own beat and have its own tone. The Crimes of Grindelwald is set in London and Paris and of course the infamous Hogwarts School of Witchcraft and Wizardry. According to Warner Bros: “JK Rowling wrote the [script] for the film, which opens in 1927, a few months after Newt helped to unveil and capture the infamous dark wizard Gellert Grindelwald. “However, as he promised he would, Grindelwald has made a dramatic escape and has been gathering more followers to his cause – elevating wizards above all non-magical beings.